Autumn over the Arctic Ocean is a season of falling temperatures and rapid growth of sea ice. However, as in recent years, low sea ice extent at the beginning of autumn means large transfers of heat to the atmosphere from open water areas, keeping the Arctic warmer than usual. Despite this warmth, freeze up is in high gear. 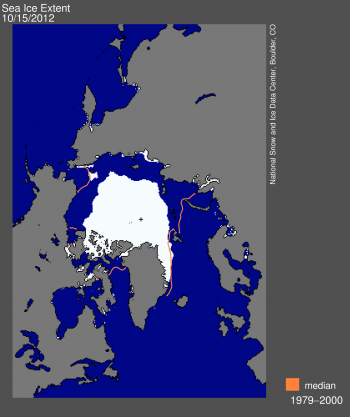 As of October 15, sea ice extent stood at 5.18 million square kilometers (2.00 million square miles). This is 3.49 million square kilometers (1.35 million square miles) below the 1979 to 2000 mean for this time of year and 70,000 square kilometers (27,000 square miles) below the same date in 2007. Although it is still at record low levels, extent is climbing fast. Large areas of the Kara, Laptev, East Siberian, Chukchi, and Beaufort seas remain open for hundreds of kilometers offshore. East of Greenland, ice extent is near average. Figure 2. 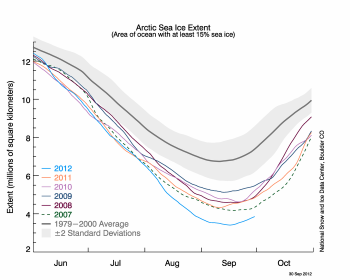 The graph above shows Arctic sea ice extent as of October 15, 2012, along with daily ice extent data for the previous five years. 2012 is shown in blue, 2011 in orange, 2010 in pink, 2009 in navy, 2008 in purple, and 2007 in green. The gray area around the average line shows the two standard deviation range of the data. Sea Ice Index data. 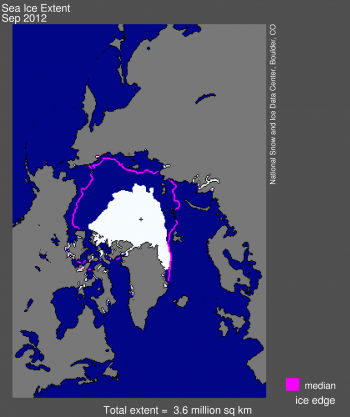 Arctic sea ice extent is increasing rapidly, at about 100,000 square kilometers (38,600 square miles) per day, expanding southward at the ice edge, as well as northward from the Arctic continental coasts. However, sea ice extent is still at record low levels for the date, compared to the satellite measurement period (1979 to 2012). On October 6, daily sea ice extent climbed above the 2007 record daily minimum (4.17 million square kilometers or 1.61 million square miles), having spent forty days below that level. On October 14, extent went above 5.0 million square kilometers (1.93 million square miles) for the first time since mid-August. Figure 3. This figure shows air temperatures as a function of height and longitude at 75 degrees north latitude. 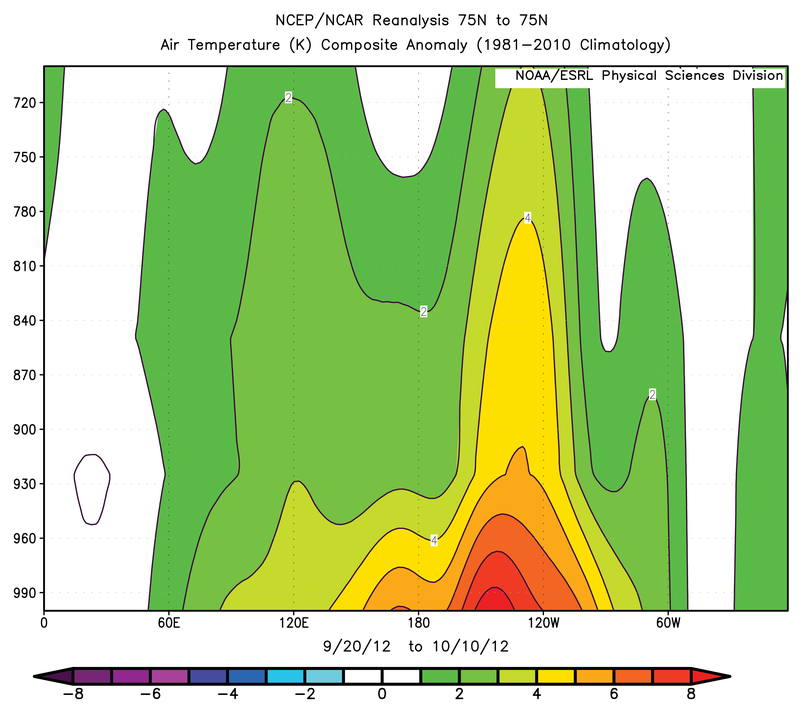 Temperatures are for the period September 20 to October 10, 2012 compared to averages for the years 1981 to 2010. Between longitudes 120 degrees west to 150 degrees west, temperatures more than 4 degrees Celsius (7 degrees Fahrenheit) above normal are found up to the 850 hPa level (roughly 4500 feet above the surface), with temperatures near the surface, in closer proximity to the warming effects of the ocean, more than 6 degrees Celsius (11 degrees Fahrenheit) above normal. The past decade has seen much stronger increases in air temperature in the Arctic compared to the globe as a whole. While this strong warming, known as Arctic amplification, has a number of causes, a primary one is declining summer sea ice extent. Through summer, solar energy is readily absorbed within expanding areas of dark, open water. When the sun sets, this heat stored in the uppermost layers of the Arctic Ocean is released upwards, keeping the overlying atmosphere unusually warm. This warming effect has been especially pronounced during the early autumn of 2012. Air temperatures averaged over the most recent thirty days of data are above average over nearly all of the Arctic Ocean. The warmest conditions compared to average are over northwestern Canada and extending into the Beaufort Sea. Here, the effect of heat released from the ocean is augmented by warm, southerly winds, and is linked to a pattern of unusually high pressure centered over the Gulf of Alaska. Figure 4. 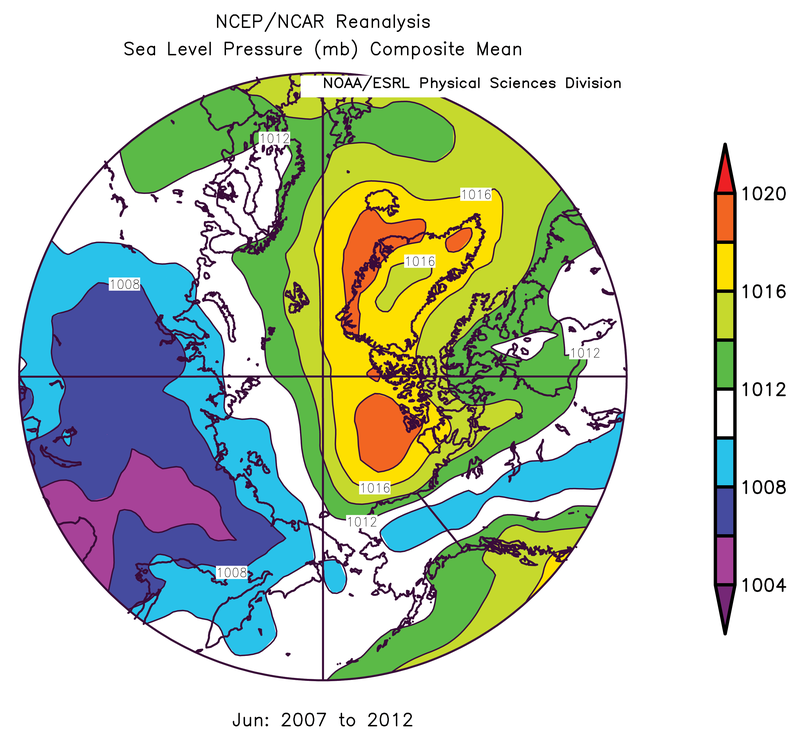 Sea level pressure for June 2007 to 2012 compared to averages over the period 1981 to 2010. The Arctic dipole anomaly refers to the combination of unusually high pressure over the northern Beaufort Sea and Greenland and unusually low pressure over northern Eurasia. 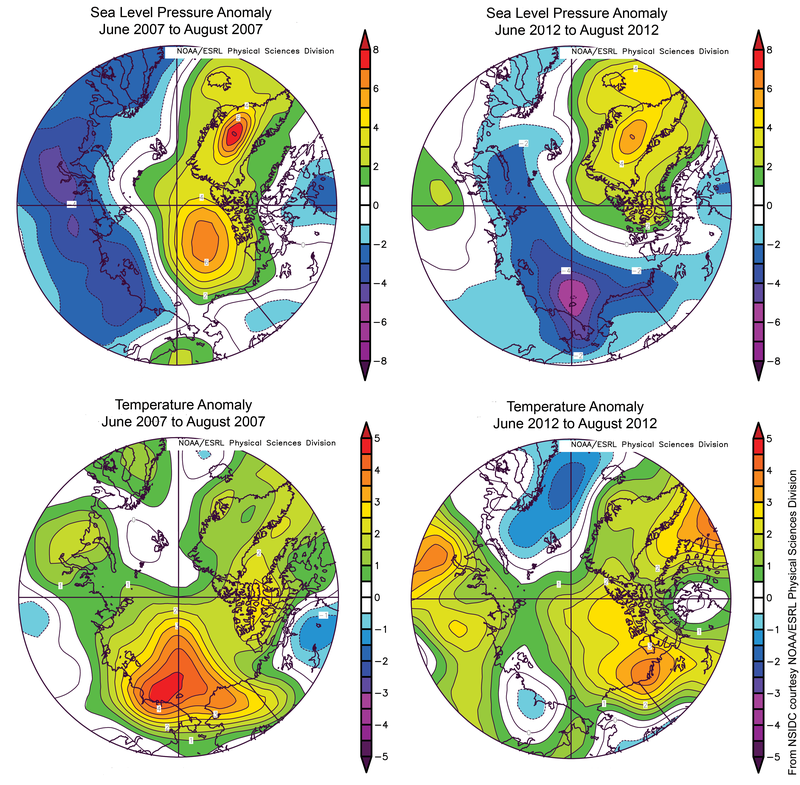 Recent research led by James Overland of the National Oceanic and Atmospheric Administration (NOAA) and Jennifer Francis of Rutgers University shows that the Arctic dipole anomaly, featuring unusually high pressure over the northern Beaufort Sea and Greenland and unusually low pressure over northeastern Eurasia, has become more common in the early summer of recent years. As discussed in previous posts, this pattern brings in warm southerly winds along the shores of the East Siberian and Chukchi seas. It favors strong ice melt in these sectors and pushes the ice away from the coast, leaving open water. The pressure pattern also favors the transport of ice out of the Arctic Ocean and into the North Atlantic through Fram Strait. The Arctic dipole anomaly was very well developed throughout the summer of 2007 and was in part responsible for the very low September ice extent recorded that year (the second lowest in the satellite record). According to Overland and colleagues, no other six-year period matches the intensity and persistence of the June pattern for 2007 to 2012 in the past sixty-three years. The pattern is linked to the general weakening of the circumpolar jet stream and the greater meandering of this wind flow. Recall from our previous post that the summer of 2012 as a whole saw a somewhat different pattern. Unusually low pressure was present along the Eurasian coastal seas and extended eastward into the Beaufort Sea, most prominently over the East Siberian Sea, with unusually high pressure centered over Greenland and the northern North Atlantic. Figure 5. 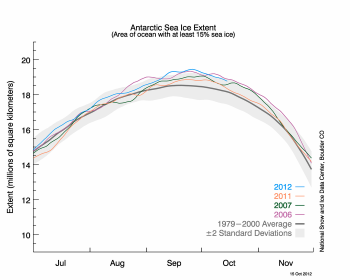 This graph shows the highest extent years for Antarctic sea ice. The blue line shows 2012, the orange line shows 2011, the green line shows 2007, and the pink line shows 2006. The 1979 to 2000 average is in dark gray. The gray area around this average line shows the two standard deviation range of the data. Sea Ice Index data. 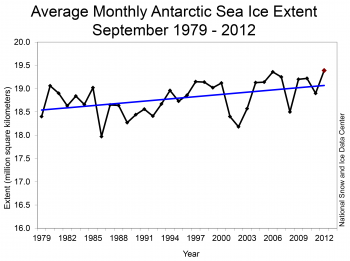 Antarctic sea ice extent dropped below record levels seen for the date but remains well above average. Journalists inquired about the cause of gradual growth in wintertime Antarctic sea ice and the record high Antarctic sea ice extent in mid-September despite general climate warming and the dramatic sea ice losses in the Arctic. As we noted in the previous post, researchers cite stronger westerly winds surrounding Antarctica, in contrast to the Arctic. See also the following news stories on Antarctic sea ice, to which NSIDC scientists contributed, under “Further reading” below. Peter Aldhous, “Why sea ice records are poles apart,” New Scientist, October 8, 2012. Justin Gillis, “Running the numbers on Antarctic sea ice,” New York Times Green blog, October 3, 2012. Richard Harris, “Scientists watch Antarctica, Arctic sea ice levels,” National Public Radio Morning Edition, October 8, 2012. Overland, J. E., J. A. Francis, E. Hanna, and M. Wang. 2012. The recent shift in early summer Arctic atmospheric circulation. Geophysical Research Letters 39, L19804, doi: 10.1029/2012GL053268. The sun has set over the central Arctic Ocean and sea ice extent is now increasing. While much attention has been paid to the record minimum Arctic ice extent set on September 16, 2012, winter sea ice extent in Antarctica has reached a record high. The Antarctic extent increase is an interesting response to changes in circulation patterns in the Southern Hemisphere. Following the record minimum that was set on September 16, 2012, Arctic sea ice has started its seasonal pattern of growth; maximum seasonal extent is expected to be reached by the end of March of next year. 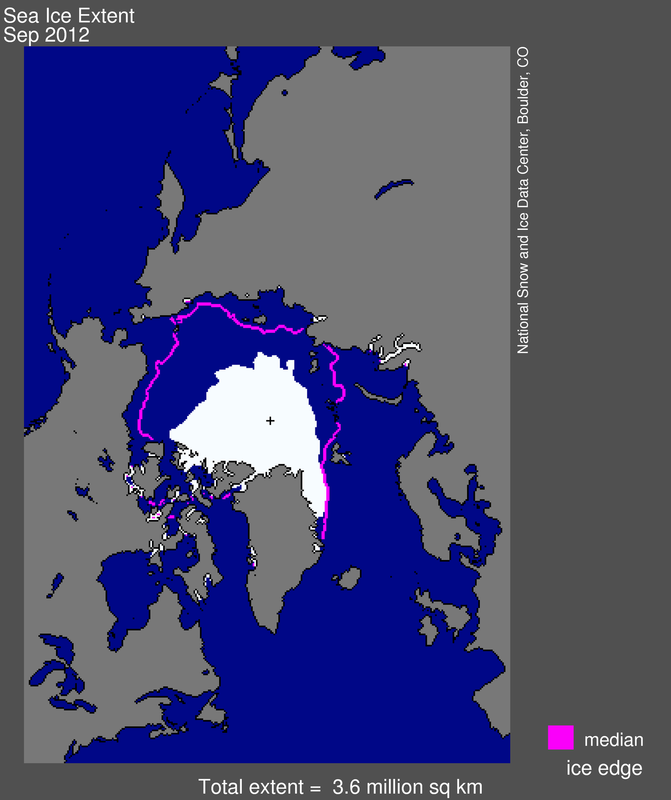 Arctic sea ice extent averaged for September 2012 was 3.61 million square kilometers (1.39 million square miles). This was 3.43 million square kilometers (1.32 million square miles) below the 1979 to 2000 average extent. September 2012 ice extent was 690,000 square kilometers (266,000 square miles) less than the previous record low for the month that occurred in 2007. Figure 2. 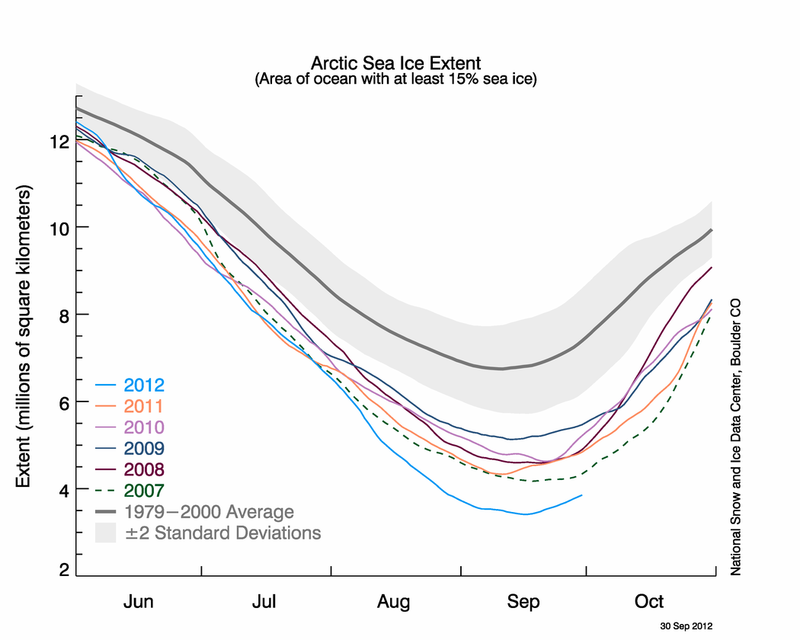 The graph above shows Arctic sea ice extent as of September 30, 2012, along with daily ice extent data for the previous five years. 2012 is shown in blue, 2011 in orange, 2010 in pink, 2009 in navy, 2008 in purple, and 2007 in green. The 1979 to 2000 average is in dark gray. The gray area around this average line shows the two standard deviation range of the data. Sea Ice Index data. The seasonal minimum in extent that occurred this year on September 16 was three days later than the average date of the minimum (September 13). Because ice extent falls through the first part of September and rises in the latter part, statistics on the average daily rate of ice loss or gain through the month are largely meaningless. More relevant is the total ice loss through the melt season. Between the seasonal maximum extent that occurred on March 20, 2012 and the September 16 minimum, the Arctic Ocean lost a total of 11.83 million square kilometers (4.57 million square miles) of ice; this is by far the largest seasonal loss of sea ice in the satellite record. The second largest seasonal loss was 10.65 million square kilometers (4.11 million square miles), in 2008. Due in part to transfers of heat from extensive open water areas to the atmosphere, air temperatures at the 925 hPa level averaged for September 2012 were from 2 to 5 degrees Celsius (4 to 9 degrees Fahrenheit) above average over much of the Arctic Ocean; much larger departures from average were the rule at levels closer to the surface. Figure 3. 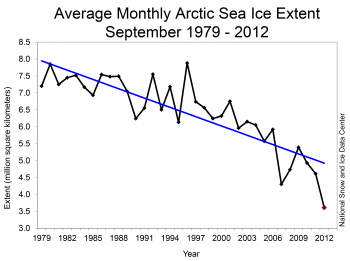 Monthly September ice extent for 1979 to 2012 shows a decline of 13.0% per decade. Arctic sea ice extent averaged for September 2012 was the lowest in the satellite record, and was 16% lower than the previous low for the month, which occurred in 2007. 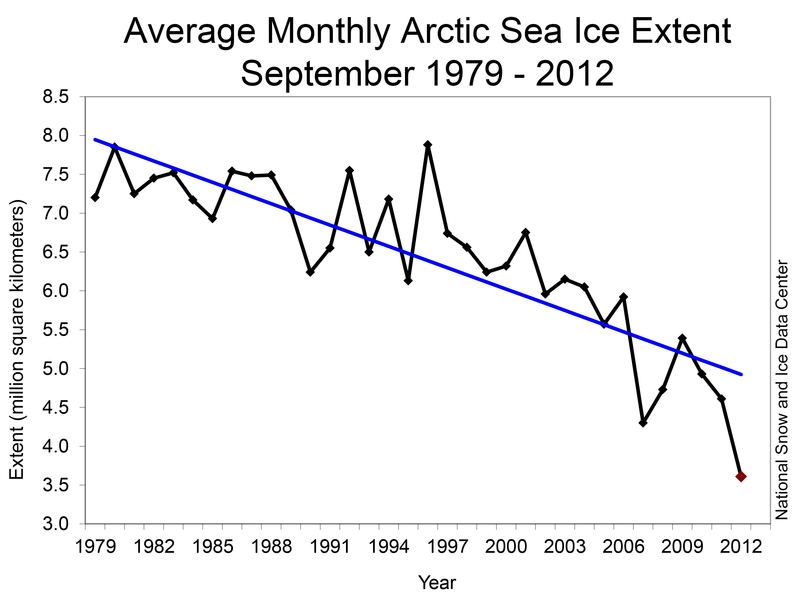 Through 2012, the linear rate of decline for September Arctic ice extent over the satellite record is now 13.0% per decade, relative to the 1979 to 2000 average. 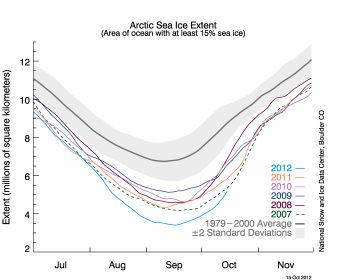 The six lowest September ice extents over the satellite record have all occurred in the last six years. Compared to the 1979 to 2000 average ice conditions, the September 2012 ice cover represents a 49% reduction in the area of the Arctic Ocean covered by sea ice. It is 2.91 million square kilometers (1.12 million square miles), or 45%, below the 30-year average over 1981 to 2010. Figure 4. These images compare sea level pressure and temperature anomalies (at the 925 hPa level) during summer 2007, the previous record low extent year, and summer 2012. Anomalies were less pronounced in 2012 than in 2007 (as shown in reds and oranges). While weather was a factor in the 2007 record low extent, the 2012 record extent occurred during near average weather conditions. Weather conditions prevailing over the summer of 2012 were quite different from those in 2007. The summer of 2007 featured unusually high sea level pressure centered north of the Beaufort Sea and Greenland, and unusually low pressure along northern Eurasia, bringing in warm southerly winds along the shores of the East Siberian and Chukchi seas (3 to 5 degrees Celsius, or 5 to 9 degrees Fahrenheit above normal), favoring strong ice melt in these sectors and pushing the ice away from the coast, leaving open water. The pressure pattern also favored the transport of ice out of the Arctic Ocean and into the North Atlantic through Fram Strait. In contrast, the summer of 2012 saw unusually low pressure along the Eurasian coastal seas and extending eastward into the Beaufort sea, most prominently over the East Siberian Sea, with unusually high pressure centered over Greenland and the northern North Atlantic. Air temperatures for summer 2012 were above average over most of the Arctic Ocean (1 to 3 degrees Celsius, or 2 to 5 degrees Fahrenheit), most prominently over the Beaufort Sea, where, because of the pressure pattern, winds were anomalously from the south. Melt began two to three weeks earlier than average in the Barents and Kara seas, leading to earlier retreat of sea ice in the region; however, air temperatures remained below average during summer in this region. This points to the impact the continued loss of old, thick ice is having on the ability of the sea ice cover to survive summer melt. Other than the August storm, the pressure pattern in 2012 does not appear to have been as favorable in promoting ice loss as was the case in 2007, and yet a new record low occurred. Figure 5. These images from September 2007 (top, left) and September 2012 (top, right) show the decline of multiyear ice since the previous record minimum extent was set in 2007. 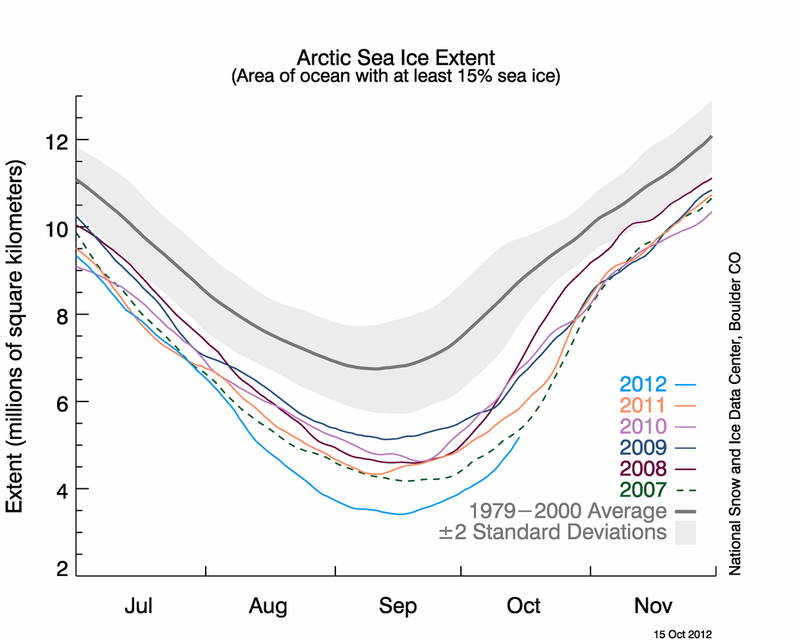 The chart at bottom shows the changes in multiyear ice from 1983 to 2012. Ice of all ages has declined; 5+ year old ice has declined quite sharply. Much of the Arctic ice cover now consists of first-year ice (shown in purple), which tends to melt rapidly in summer’s warmth. Entering the melt season, a thinner ice cover made the Arctic sea ice cover more vulnerable to weather, such as the storm that tracked through the Arctic in early August. Because the ice was thin and already decaying by the time of the storm, it was quickly broken up and melted by winds and waves. The end-of-summer sea ice cover was not only the least extensive in the satellite record, but also very likely the lowest volume, based on combined model-observation estimates from the University of Washington, and inferred from ice age. The extent of ice of nearly all age categories declined from last year and remained at record low levels. The only category that increased was 4-year-old ice. This is ice that has aged since the previous record low minimum extent in 2007, when substantial amounts of first-year ice were lost. This 4-year-old ice will now age into the 5+ year category as the ice-growth season begins. However, even with this replenishment this winter will see only approximately 20% of the old (5+ year) ice compared to the 1980s. Because of the record summer ice loss, this winter will see the Arctic Ocean region even more dominated by the thinner first-year ice. 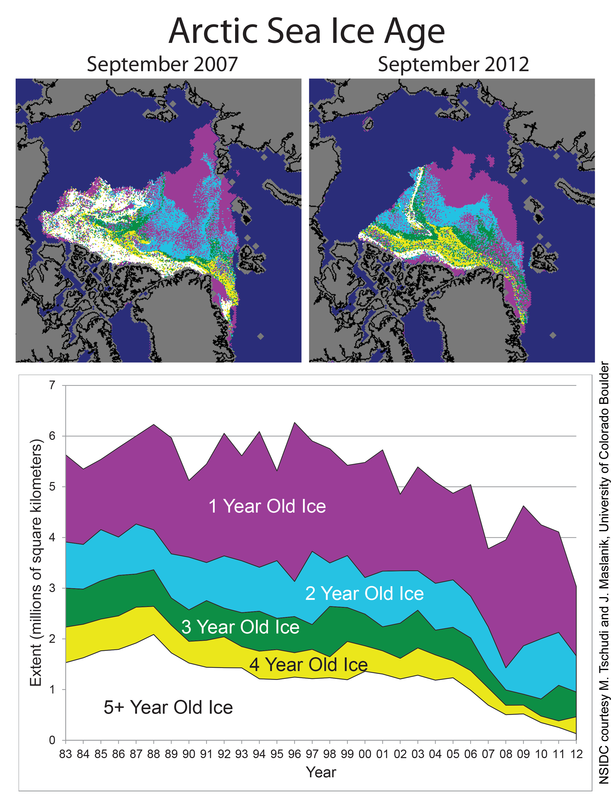 As shown in Figure 5, the amount of ice in nearly all age categories has decreased since 2007, particularly the oldest ice. Figure 6a. 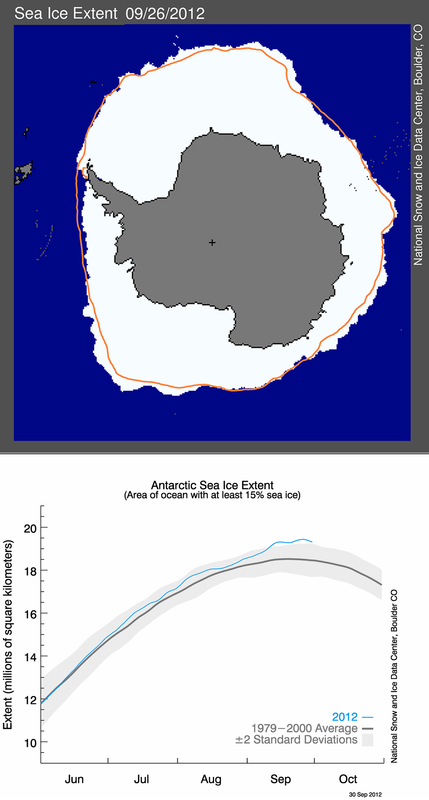 Antarctic sea ice extent for September 26, 2012 (top image) was 19.44 million square kilometers (7.51 million square miles). The orange line shows the 1979 to 2000 median extent for that day of the year. The black cross indicates the geographic South Pole. 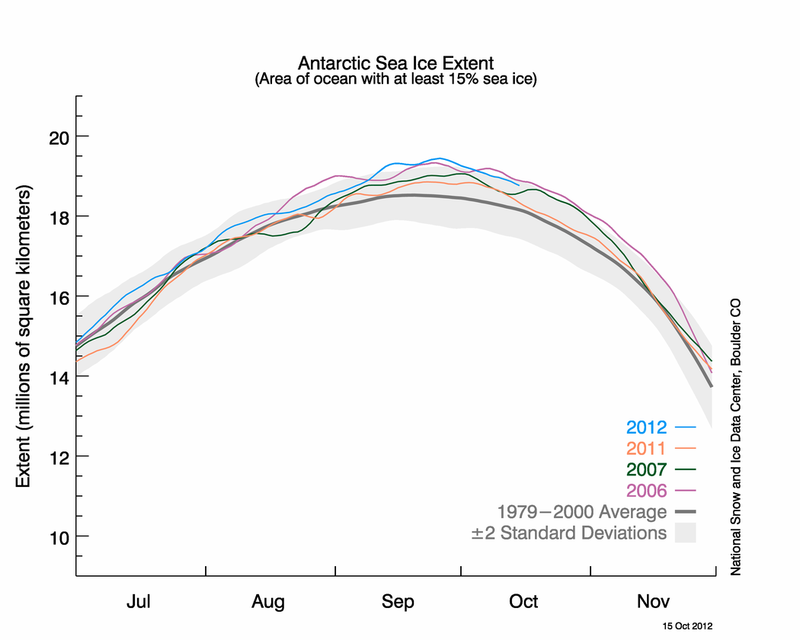 The graph (bottom) shows Antarctic sea ice extent as of September 30, 2012. The 1979 to 2000 average is in dark gray. The gray area around this average line shows the two standard deviation range of the data. Sea Ice Index data. Figure 6b. 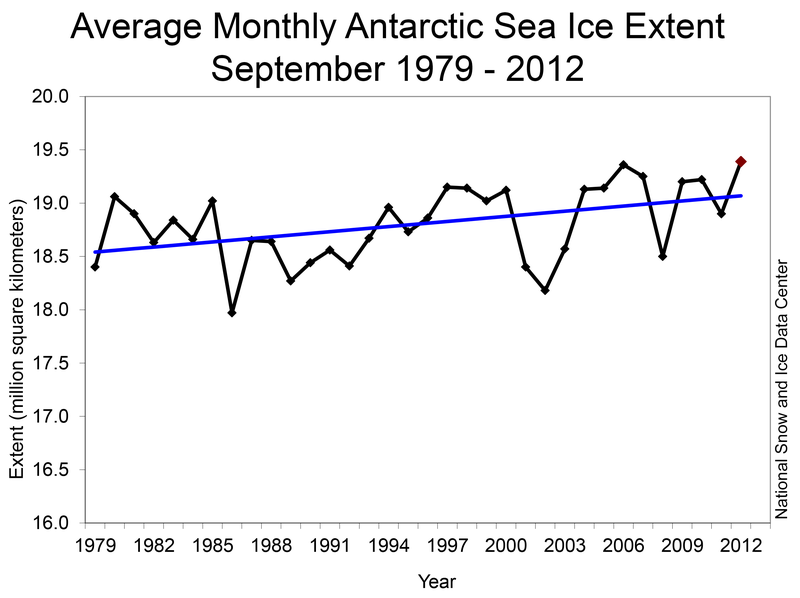 The monthly September Antarctic extent trend for 1979 to 2012 is +0.9% per decade. As the Arctic was experiencing a record low minimum extent, the Antarctic was reaching record high levels in the satellite record, culminating in a winter maximum extent of 19.44 million square kilometers (7.51 million square miles) on September 26. The September 2012 monthly average was also a record high, at 19.39 million square kilometers (7.49 million square miles) slightly higher than the previous record in 2006. The September extent trend for 1979 to 2012 is just above the statistical significance level (0.9% per decade, plus or minus 0.6%). The new Antarctic sea ice September value is slightly greater than typical year-to-year variations, and is roughly equal to a 25 mile (40 kilometer) northward shift in the location of the ice edge relative to the 1979 to 2000 average. The trend for ice extent growth during Antarctic winters is about 16,000 square kilometers per year (6,200 square miles) or roughly an area the size of Connecticut. In comparison, the decline in Arctic summer sea ice extent is an area about the size of Indiana (91,600 square kilometers per year, or about 35,400 square miles). Our colleague, Dr. Sharon Stammerjohn of INSTAAR, University of Colorado, provides a review of the differences between Arctic and Antarctic climate controls on sea ice and helps place the events in context. First, climate is warming over much of the Antarctic continent, as shown in several recent studies (e.g., Chapman and Walsh, 2007, Monaghan et al., 2008, Steig et al., 2009) and is related to Pacific Ocean warming (Ding et al., 2010) and circumpolar winds. Both warming and ozone loss act to strengthen the circumpolar winds in the south. This is due primarily to persistently cold conditions prevailing on Antarctica year-round, and a cold stratosphere above Antarctica due to the ozone hole. Stronger winds generally act to blow the sea ice outward, slightly increasing the extent, except in the Antarctic Peninsula region, where due to geography, winds from the north have also increased, pushing the ice southward. Thus, sea ice extent near the northwestern Antarctic Peninsula continues to decline rapidly, while areas in the Ross Sea and the southern Indian Ocean show significant increases (Stammerjohn et al., 2012). Circumpolar-averaged sea ice extent changes nearly cancel each other out for all months of the year (Parkinson and Cavalieri, 2012). This winter, atmospheric conditions were near average overall, with roughly equal areas of cooler and warmer air temperatures over the sea ice. Comparing winter and summer sea ice trends for the two poles is problematic since different processes are in effect. During summer, surface melt and ice-albedo feedbacks are in effect; winter processes include snowfall on the sea ice, and wind. Small changes in winter extent may be a more mixed signal than the loss of summer sea ice extent. An expansion of winter Antarctic ice could be due to cooling, winds, or snowfall, whereas Arctic summer sea ice decline is more closely linked to decadal climate warming. 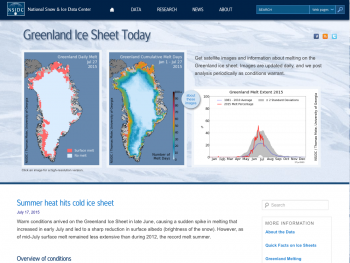 For more information on Antarctic climate and sea ice, see NSIDC’s Icelights, our Sea Ice Index, and our State of the Cryosphere Web sites. The NASA Goddard Ozone Watch site also provides additional background information. Parkinson, C., and D. Cavalieri. 2012. 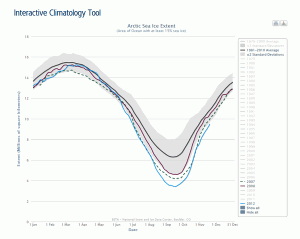 Antarctic sea ice variability and trends. The Cryosphere 6, 871-880, doi:10.5194/tc-6-871-2012. Stammerjohn, S., R. Massom, D. Rind, and D. Martinson. 2012. Regions of rapid sea ice change: an inter-hemispheric seasonal comparison. Geophysical Research Letters 39, L06501, doi:10.1029/2012GL050874. Ding, Q., E. Steig, D. Battisi, and M. Kuttel. 2011. Winter warming in West Antarctica caused by central tropical Pacific warming. Nature Geoscience 4, doi:10.1038/ngeo1129. Steig, E., D. P. Schneider, S. D. Rutherford, M. Mann, J. C. Comiso, and D. T. Shindell. 2009. Warming of the Antarctic ice-sheet surface since the 1957 International Geophysical Year. Nature 457, 459-462, doi:10.1038/nature07669. Monaghan, A. J., D. H. Bromwich, W. Chapman, and J. Comiso. 2008. Recent variability and trends of Antarctic near-surface temperature. Journal of Geophysical Research 113, D04105, doi:10.1029/2007JD009094. Chapman, W. L., and J. E. Walsh. 2007. A synthesis of Antarctic temperatures. Journal of Climate 20 (16), 4096-4117, doi:10.1175/JCLI4236.1.